Home » ASUS Brand » ASUS F555LA-AB31 15.6-inch Full-HD Laptop (Core i3, 4GB RAM, 500GB HDD) with Windows 10 i3? I recommend this ASUS F555LA-AB31 – a Windows 10 new laptop, to anyone who looks for a laptop for daily usage. I said it, because there are a lot of people out there who bought things that they don’t really need. This laptop has an i3 CPU, but it is more than adequate to perform your computer tasks. Check this model if you need an i7 with 1tb laptop. If you are gamer, and want to use this laptop to game often, I suggest you to look somewhere else for a power gamer device like this one, but if you mostly use your PC to surf, watch YouTube, listening to music, emails, and working with MS Office, it will be more than capable. – The hard drive is on 5.400RPM, it is not a deal breaker, and you cannot expect an SSD on a laptop at this price. 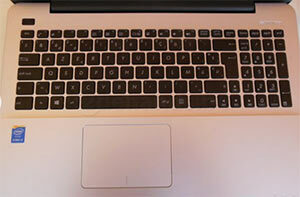 – Cheap looks with the trackpad, but again, with the price, I don’t think it is not appropriate. – No installation disc, so you will need to create a restore point with your laptop, which is easy to do. If you need to download the manual, you can read this page first. – For a 400 bucks price range, this ASUS F555LA-AB31 is probably the only one which has decent specs, and a full HD 1080p screen, no touchscreen. I really doubt there are any competitors with full HD screen and these specs at this price point. Chromebooks were my consideration, but I decide on this ASUS F555LA model for full functional device, and the full HD is a big plus. The viewing angle is ok, though it would clearly look terrible, if you compare it with a top end laptop that costs thousands bucks. -The keyboard has numberpad, chiclet keys, feels good to type, has responsive keys and well located. – Decent battery life, 3-4 hours on one charge, and I guess the battery life of a laptop is pretty much depending on what you are doing on your device. – I like the new Windows 10, so this laptop comes with pre-installed Windows 10. Whereas most new laptops these days, will come with Windows 8.1 and you will need to upgrade yourself to Win 10, and you might have some issues while upgrading with the driver – this one has already Windows 10. – Slim and has very nice texture, it is not a fingerprint-magnet. – For technical people only, you can easily upgrade the memory, there is another empty slot to add new memory stick. I am pleased with my purchase, got best price here, a solid thin laptop. This ASUS F555LA-AB31 is worth considered, because it would be hard to find another 400 bucks laptop that has a full HD 1080p screen.